An important resource for scholars of contemporary art and architecture, this volume considers contemporary art that takes architecture as its subject. 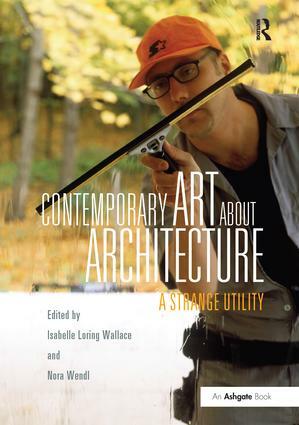 Concentrated on works made since 1990, Contemporary Art About Architecture: A Strange Utility is the first to take up this topic in a sustained and explicit manner and the first to advance the idea that contemporary art functions as a form of architectural history, theory, and analysis. Over the course of fourteen essays by both emerging and established scholars, this volume examines a diverse group of artists in conjunction with the vernacular, canonical, and fantastical structures engaged by their work. Iñigo Manglano-Ovalle, Matthew Barney, Monika Sosnowska, Pipo Nguyen-duy, and Paul Pfeiffer are among those considered, as are the compelling questions of architecture's relationship to photography, the evolving legacy of Mies van der Rohe, the notion of an architectural unconscious, and the provocative concepts of the unbuilt and the unbuildable. Through a rigorous investigation of these issues, Contemporary Art About Architecture calls attention to the fact that art is now a vital form of architectural discourse. Indeed, this phenomenon is both pervasive and, in its individual incarnations, compelling - a reason to think again about the entangled histories of architecture and art. Contents: Prologue; Introduction, Isabelle Loring Wallace and Nora Wendl; Section I Origins: Approaching architecture: the case of Richard Serra and Michael Asher, Miwon Kwon; Replacing the hut: Dan Graham’s Two-Way Mirror Cylinder Inside Cube, Jennifer Johung. Section II Photography as Architecture: A becoming image: Candida Höfer’s architecture of absence, Jae Emerling; Thomas Struth: architecture and allegory, Paula Carabell; N-O-W-H-E-R-E, Isabelle Loring Wallace. Section III Re-Building Mies’ Modernism: Media as modern architecture, Beatriz Colomina; More almost nothing: Iñigo Manglano- Ovale and the performance of Mies van der Rohe’s Baukunst, Matt Burgermaster; Image as architecture: Thomas Ruff and Mies van de Rohe, Martin Søberg. Section IV Re-Visionaries: The architecture of As If: Josiah McElheny's sculptural proposals, Spyros Papapetros; The pavilions of recollection: architecture and memory in contemporary Eastern European art, Levente Polyak; History re-visioned: Matthew Barney and the neo-Baroque, Rebecca Brantley. Section V Impossible Architectures/Immodest Proposals: Vitruvian figure(s), Nora Wendl; Architecture future perfect: Lara Almarcegui and the ’ghost of content’, Jasmine Benyamin; The manifold dimensions of Janice Kerbel’s architectural diagrams, Jakub Zdebik; Bibliography; Index. Isabelle Loring Wallace is Associate Professor of Contemporary Art at the Lamar Dodd School of Art, University of Georgia, USA. Nora Wendl is Assistant Professor of Architecture in the School of Architecture at Portland State University, USA.